This book offers an accessible examination of the human rights of migrants in the context of the UN’s negotiations in 2018. This volume has two main contributions. Firstly, it is designed to inform the negotiations on the UN’s Global Compact for Safe, Orderly and Regular Migration announced by the New York Declaration of the UN General Assembly on 19 September 2016. Second, it intends to assist officials, lawyers and academics to ensure that the human rights of migrants are fully respected by state authorities and international organisations and safeguarded by national and supranational courts across the globe. The overall objective of this book is to clarify problem areas which migrants encounter as non-citizens of the state where they are and how international human rights obligations of those states provide solutions. It defines the existing international human rights of migrants and provides the source of States’ obligations. 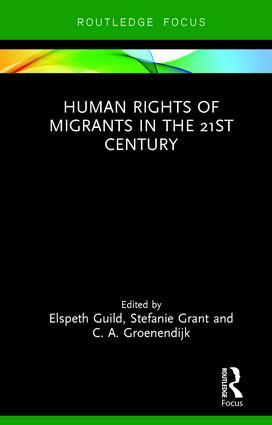 In order to provide a clear and useful guide to the existing human rights of migrants, the volume examines these rights from the perspective of the migrant: what situations do people encounter as their status changes from citizen (in their own country) to migrant (in a foreign state), and how do human rights provide legal entitlements regarding their treatment by a foreign state? This book will be of much interest to students of migration, human rights, international law and international relations. Elspeth Guild is Jean Monnet Professor ad personam, Queen Mary University of London, UK. Stefanie Grant is Senior Visiting Fellow, Centre for the Study of Human Rights, London School of Economics, UK. C. A. Groenendijk is Emeritus Professor of Sociology of Law, Radboud University, Netherlands.